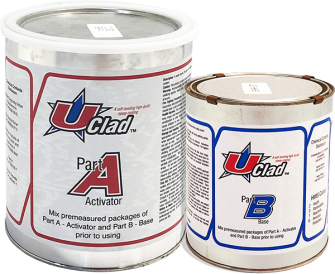 UClad is a self leveling 100% epoxy coating used to repair spalled and pitted areas of concrete surface. UClad is odor free, has very little volatile organic compounds and has no combustible fumes. UClad can be applied to any concrete surface with imperfections such as spalls or pits. UClad can be applied in multiple coats to create a smooth finish over extremely rough concrete. 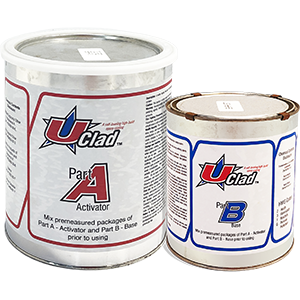 UClad is applied between primer of UCoat or UPrime within 72 hours of the primer. For application of the UClad a squeegee and a 3/8″ nap roller cover should be used (included in the UClad Kit). Use squeegee to spread the UClad and back roll with a 3/8″ nap roller to even out the coating. Coating the entire surface will create a more desirable finish, otherwise a noticeable surface texture difference will be present when using UClad in sections. Typical Coverage 350 sq. ft. at 12 mils avg. thickness. Kit includes UClad epoxy (choice of color), applicator tools, mixing pail and instructions Add $55 for Safety Colors. Typical Coverage 350 sq. ft. at 12 mils thickness. Includes UClad epoxy coating materials only. Add $50 for Safety Colors. Typical Coverage 175 sq. ft. at 12 mils thickness. Includes UClad epoxy coating materials only. Add $50 for Safety Colors.